You may have seen the image of a graffitied Elizabeth Line train parked at Abbey Wood this week. The photo is from Bexley is Bonkers. According to those living locally the train being tagged was no great surprise. 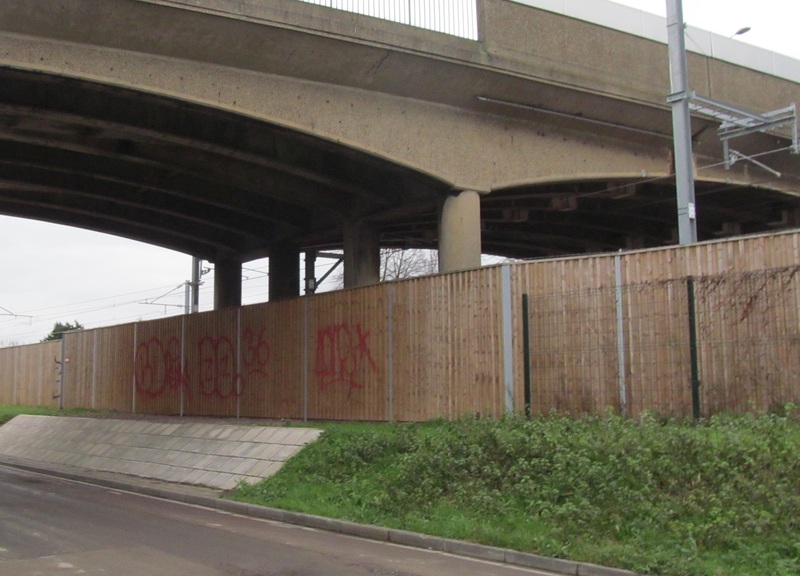 Aside from flooding issues in some neighbouring homes, Network Rail have barely maintained new bridges and fencing installed the local area and graffiti has been appearing (and not being removed) in a few places, including on some of the grimmest bridges I’ve seen anywhere. Flytipping is common too and cleaning poor. I’ve noticed the bridge issue when in the area. The pedestrian footbridge over Church Manorway started to be tagged on its concrete base at least a couple of years ago. This photo was taken in October 2017. It wasn’t cleaned for months after. When I recently passed the entire base was covered. The bridges themselves are often dingy places consisting of syringes, fly tipping and all sorts of rubbish. For weeks or months on end. The kind of thing to put people off walking or cycling. 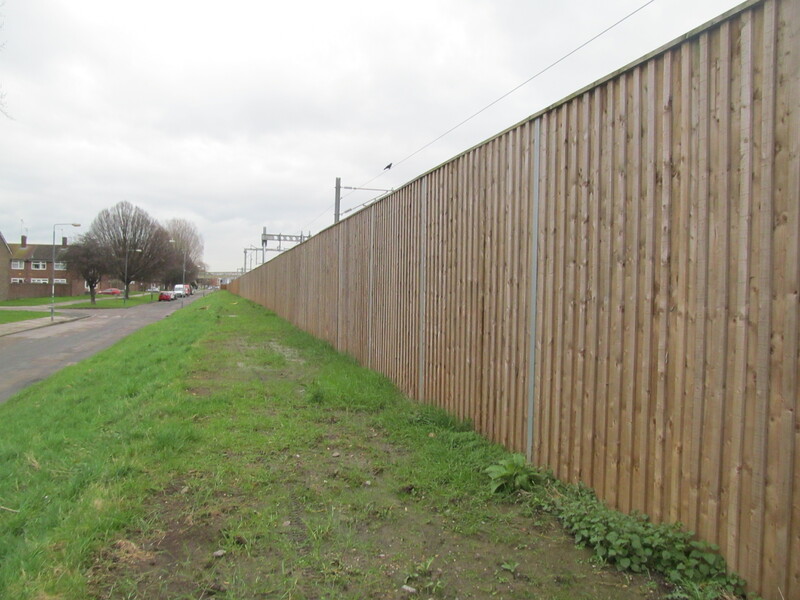 In their wisdom Network Rail also decided to replace miles of line side mesh fencing between Plumstead and Abbey Wood – which had foliage mostly covering it and was quite pleasant – with a wooden fence. For miles and facing onto many homes. It just invites vandalism. the reason given is to prevent excessive sound but I’m told there was never any complaints about existing services (at up to 10 an hour) being too noisy through a wire fence. According to locals a wire mesh fence was then due to be placed in front of the wooden fence. A small section was insatlled. But then it stopped despite earlier plans having it continue along the entirely of the fence. The exposed wooden fence was promptly graffitied to immediately prove how silly it is not to have protection through mesh fencing. Small section of mesh fencing to right stops. Unprotected fencing immediately graffitied. By the way, the scruffy land on the left is council owned and exactly where Meridian Home Start should be providing much needed homes. It’d be no great loss of greenery. The other side of the road has better maintained greenery. But I digress. Back to the wooden fences and they can’t even be easily cleaned as jet washing discolours the timber resulting in odd patches. In five years it could look a mess. 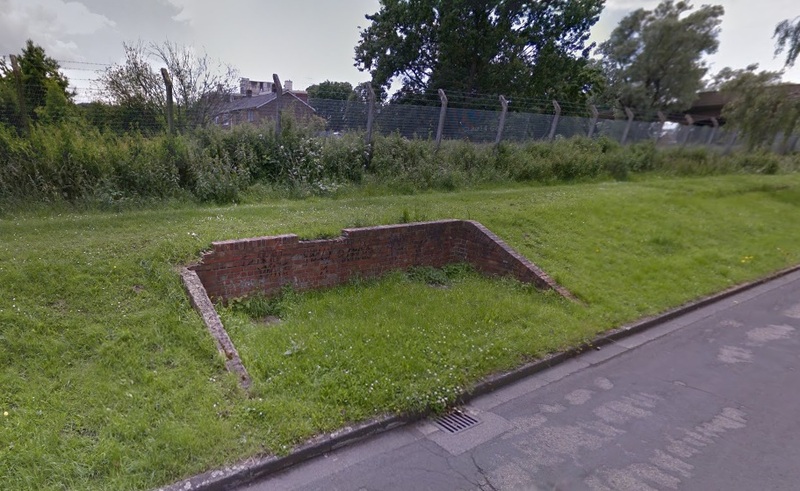 – and be visible to hundreds of adjoining homes. Graffiti wouldn’t be so bad if any actual talent was on show but it’s the usual generic tags. Some will no doubt say, well, it’s Abbey Wood. It’ll happen. Yet given no cleaning is happening in places since installation two or three years ago it’s hardly more prevalent than other areas. It’s just not being cleaned. 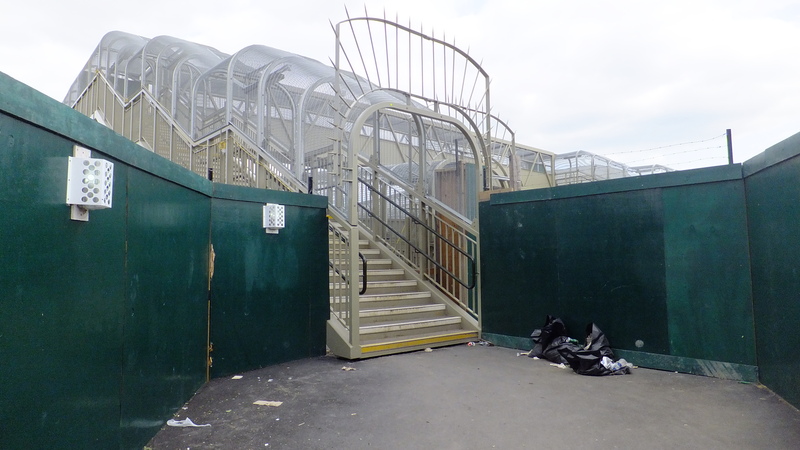 Less wealthy areas should not be resigned to such poor design and then maintenance from Network Rail. With recently installed infrastructure decaying quickly due to poor planning, the train sitting there was going to be targeted sooner or later. Yet the train will be moved and cleaned. That’s not a long term problem. The bridges and fences are. It’s quite sad, But I wouldn’t actually mind if Network Rail joined some Graffiti Club sort of thing and the people decorated the plain Wooden Walls with talented Graffiti, It would be quite fitting with the area and would probably stop people Graffiti over it. What, you actually think graffiti is better than plain wooden fencing? 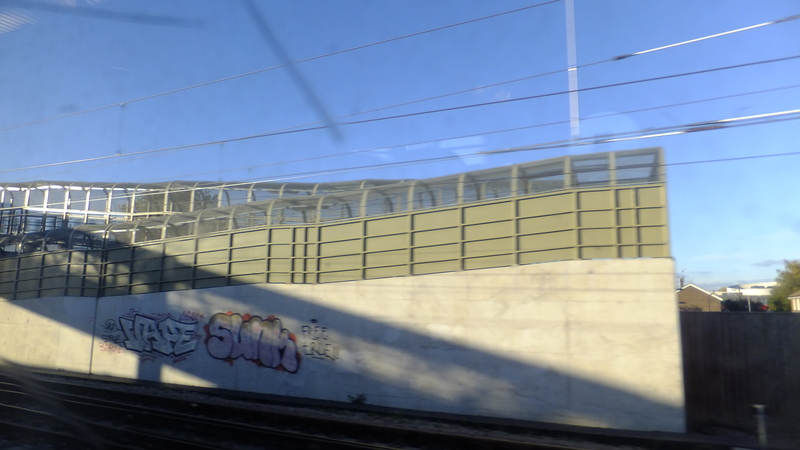 The problem is with the vandals creating the graffiti, not Network Rail putting up fences which is normal in every other part of the world. Just goes to show what a scummy place this part of London is. I always think that if someone can get access to and spend ages spray painting/tagging a train it is indicative of lax security which would also allow someone in for more nefarious puposes. In these days of terrorism it’s inexcusable. Trains should *always* be kept in secure sites. The bridges they installed are just horrible. They wouldn’t look out of place in a prison. Grey green drab monstrositys. Disgusted that so big little thought or money was put into the bridges and the rest of it. It’s indicative of our have and have not society that’s been created. Got some for a nicer bridge? It doesn’t help that half of Abbey Wood resides in Greenwich, who are as equally disinterested in maintaining the area as Bexley council, despite the general affluence of the borough. There is no crime in improving a community, bringing Elizabeth line to Abbey Wood is not a crime but why are blaming network Rail and cross rail efforts. What kind of a society are we? Instead for us to put our voices together to blame the perpetrators, we are condemning the good job done by the cross rail. Why are we supporting anti social behaviour in our society. Let the criminal face the wrath of law. Blame everything on network rail. Don’t worry about the scumbag drug addicts that left the needles, the pikies that fly tipped, the vandals that sprayed graffiti, there all ok. The wooden fence looks much better than that old wire fence, is harder for the little shits to climb and if they graffiti it, then they are just making their own town look bad. Stop the problems at source and stop moaning that the council didn’t spend tax payers money putting right these issues caused by scumbags who i bet dont pay anything into society. It goes without saying that the people doing it are ultimately at fault and deserve punishment. I didn’t think that needed to be stated as it’s a given. This site however is looking at design and how that works around issues, and as graffiti is sadly going to happen it’s important to make sure when it does it doesn’t affect everyone, and to use design to mitigate that. I’m not sure how reading the article people could see it as an excuse for the minority of idiots who do things to detract from their own community. You can, indeed, design your way out of some problems, but the money has to be spent. If you just go for the bog-standard, then people will take advantage. You can’t graffitti a chainlink fence. So it’s Network Rail’s fault that the residents graffiti the place? Phew as a parent with two teenage boys, I thought it could have been a lack of parental control, discipline and respect that was a key factor. No, it’s not Network Rail’s fault. 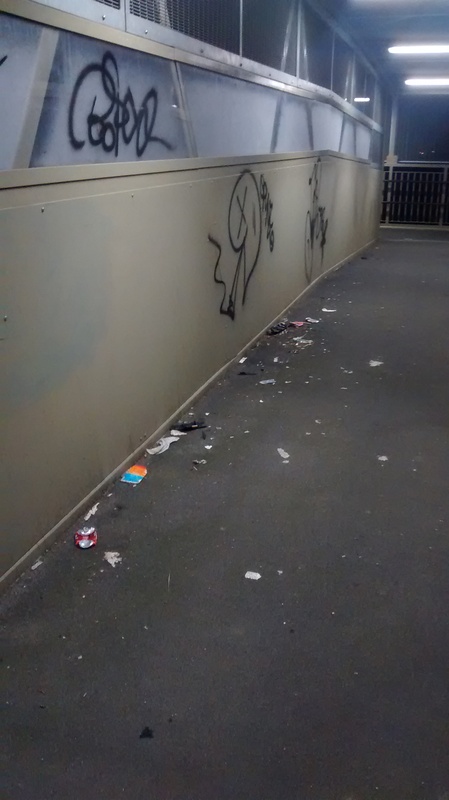 But sitting there wringing your hands and pontificating about “discipline and parental control” isn’t going to magically make people not want to graffiti – hence, we need to consider that there are measures that can be taken on the infrastructure side of things to discourage this behaviour. Sorry, one thing to have a dig at the council and trains for not cleaning the stuff every day, but how about people don’t crap on their own doorstep? If people didn’t act like they were feral there wouldn’t be a need to remove syringes and tagging. Phew, at least there are a few sane citizens left judging by the latter comments. Whilst I agree that the bridges look grim, blaming Network Rail for the graffiti is preposterous. Blame the vandals and the parents. Those wooden panels look completely normal to me and are present in many parts of London. What about the trains themselves? Since the start of this year Southeastern’s trains have been plastered in graffiti (well, tags, usually some idiot just spraying their name over and over again). Has security been cut at the depots? Southeastern need to find who is doing it and arrest them – seeing as they like spraying their names over everything it shouldn’t be too hard to prove it was them. 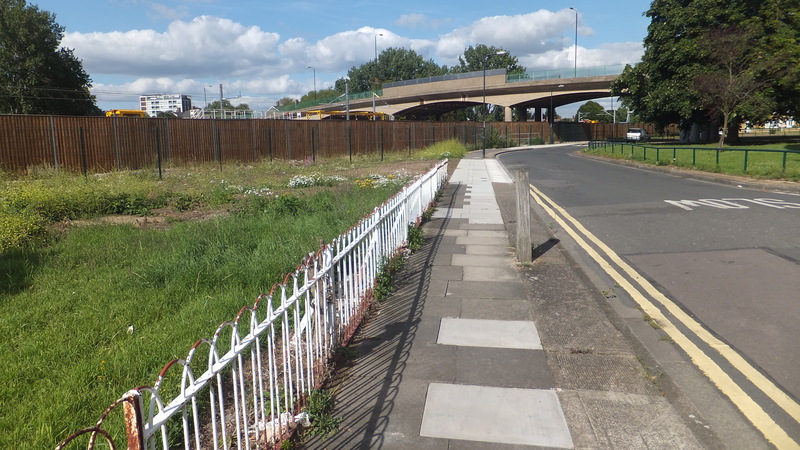 I don’t think the author or anyone else blames Network Rail for what some idiots do – but the morons are a tiny minority and the majority suffer here due to poor design which makes these things have greater impact. NR are also at fault for not cleaning. Of course this doesn’t excuse it and the little shits need punishment but the design is an issue. Living next to the line there’s no way the wooden fence is harder to climb than what was there before. Plus there’s no excuse for the bridge design. Even if kept clean its just horrible. The pics above don’t lie. It’s intimidating and some older people I know hate crossing it. I can’t believe people think the article puts the blame for the vandalism on Network Rail! 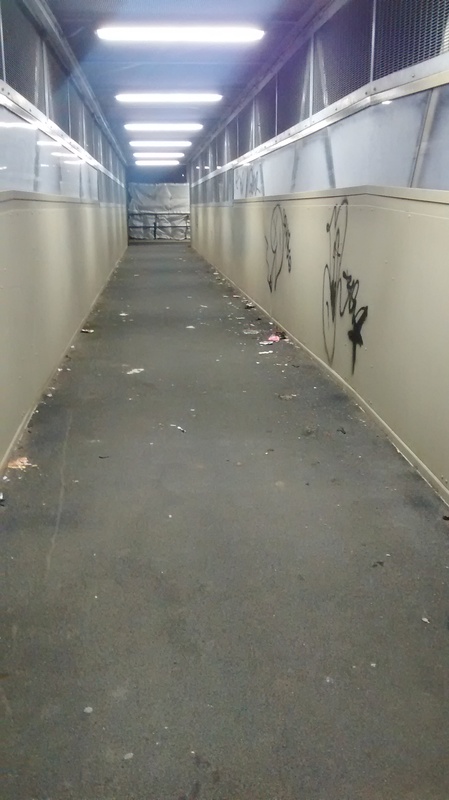 The pictures of the bridge and environment are grim, and it’s very shocking to hear some places are left littered with syringes for weeks on end. The wooden fencing needs a trellis of some sort to plant some greenery. The bridge is awful. It costs no more money to choose a shade of colour that isn’t so dreary. Possibly the worst bridge I’ve seen installed by the railways in 30 years. No where else gets such a drab design. Elderly people I know won’t use it as they feel intimidated. Poor design is a fundamental reason for that. It makes one feel uneasy even if no actual danger.